Every year, I create a birthday layout for Trevor using adjectives to describe him. 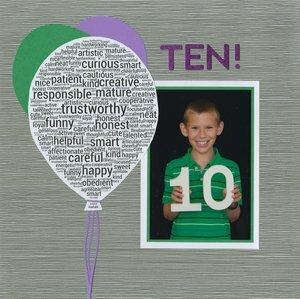 When I made Trevor at 9, I thought it would be fun to use a word cloud for his 10th birthday that incorporated all the words I'd used to describe him each year. So that's what I did! I made the word cloud using wordart.com/. I typed in my list of words from each layout, then chose the font and balloon shape. The words that appear the largest are the ones that I repeated the most over the years. Once I was happy with the design, I printed it and cut it out. It was so easy and I'm really happy with the layout. And yes, Trevor is 11 years old. This has been sitting on my desk 3/4 done for a very, very long time. In fact, I finished up the Trevor at 11 layout right after this one. I'll share that tomorrow. I LOVE that! What a great way to highlight all Trevor's wonderful qualities. Very nicely done. LOVE how the word cloud fits in a balloon...great design element! Loveeeeee this! LOVING how you did the words in the balloon!!!!!!!!!! Saw this at SB.com... love it; especially the Balloon Word Art!